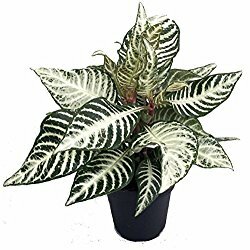 The zebra plant is grown for its foliage which is bright green with striking white veins. 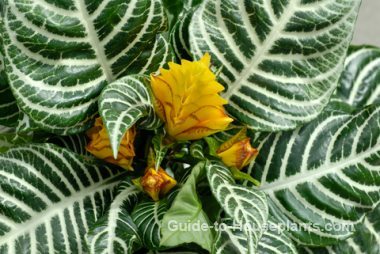 An added benefit are the bright yellow flowers that bloom in the fall. The flowers last for a few days but the bracts stay on for about 6 weeks. When given enough light the plant will often bloom again during the following spring. After flowering in the spring the plant needs to be cut down, leaving a couple of lower leaves. This is to prevent it from becoming too leggy. 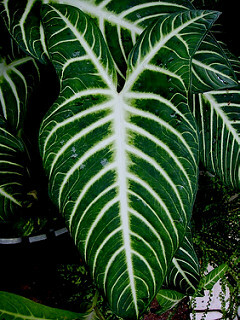 This tropical plant likes a humid atmosphere. A room humidifier is the best way to provide moisture or standing the pot on a tray of wet pebbles. Keep the soil moist year round. Don't allow the soil to dry out. It is best to give it a small drink every day rather than to flood it at once. Be cautious about repotting. The zebra likes to be slightly pot-bound and blooms better this way. Wipe the leaves with damp cloth to keep them shiny. Temperature should be between 65 and 80 degrees. Fertilize with monthly spring and summer with balanced liquid fertilizer diluted by half. Soil should be peat moss based or African violet mix. Start new plants by taking cuttings in spring or summer. After cutting the stem just below a node dip the cut ends in rooting hormone powder then insert into seed starting mix or perlite. Enclose in plastic or glass to hold in humidity. 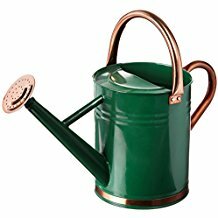 Set in indierect light keep watered. Remove covering after about 3 weeks, gradually exposing to more light. Voila! New growth in about 6 weeks.